Sea Ray really managed to produce something special with the 44 Sedan Bridge. This vessel is an extremely spacious flybridge sports cruiser with 2 cabins and 2 bathrooms. The large flybridge entertaining area keeps the skipper in the limelight as they helm the vessel whilst being able to socialise with friends and family. 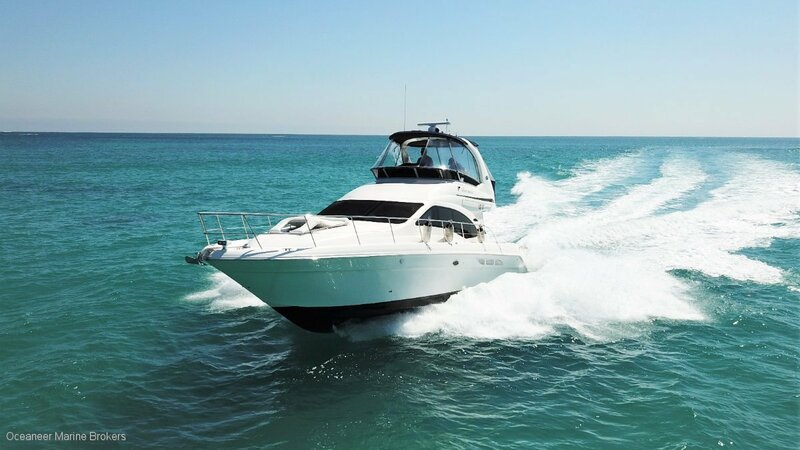 Powered by two reliable and efficient Cummins QSC-500, this Sea Ray will cruise comfortably at 26 knots. This particular model has had one Australian owner since import in 2010. She has been boatman maintained fortnightly, and there is an impressive and well documented service history on board the vessel. A hydraulic swim platform keeps the tender high and dry and the foredeck clear of clutter. Plenty of accommodation with a master suite, a twin room which can convert to a king bed with an insert plus a double fold out lounge in the saloon. Get ready to enjoy the fast approaching summer weather and come inspect this brilliantly appointed launch. Contact one of our experienced brokers on (08) 9243 6373 or at sales@oceaneermarine. Com. Au.